Some soccer videos require hundreds of words to describe their true beauty and resonance. The passing angles are dissected to the nth-degree, or the trajectory of a free kick is gushed about as the work of art it truly is. 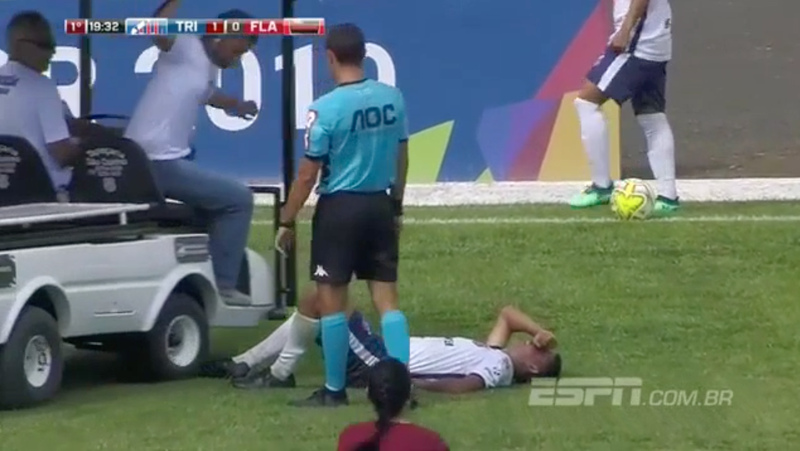 Other soccer videos are just a dude running over another dude’s foot with a medical cart. That’s Bernardo, a player for Trindade AC’s Under-20 side, writhing in pain in the 20th minute of Sunday’s Copa São Paulo de Futebol Júnior match against famed Brazilian club Flamengo. The injury was bad enough to require the medical cart, but not so bad that the driver of said cart would pay attention to where he’s driving. Maybe the best part is that everyone thinks this is a totally hilarious thing to happen! The driver clearly feels no remorse for running over poor Bernardo’s foot; he’s immediately laughing at the mishap, as is the other gentleman hopping off the cart. And even the commentators get in on the act, cracking up while the player is near tears, whether from pain or from the shame of knowing that he’s about to go viral for the wrong reasons. Thankfully for Bernardo, it was more the shock of having his foot crushed by the very vehicle coming to rescue him that jarred him, not any lasting injury. According to Globo Esporte, the player was able to eventually return to the game, which his side ended up winning 1-0. Why Is A Mascot Getting Hurt Funny?